We have all become familiar with how our television screens offer us, from the comfort of our living rooms, a small window onto the wide world outside. An aquarium also provides a glimpse into a different universe - but this time inhabited by real, live creatures. In a dentist's surgery, a tank of Amazonian fish faces the patient's chair. A lot of thought and work goes into a topclass aquarium. 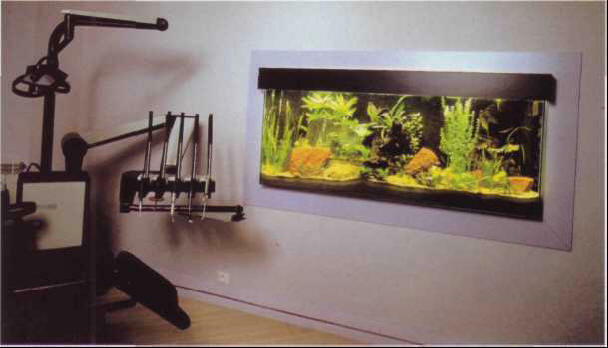 We select the best site, we want fish and decor which satisfy our sense of beauty. Before long, our new purchase has relegated to the background our photos, pictures and even the TV. The last ten or so years have seen the aquarium come into its own in institutions and public buildings. In educational establishments it represents an important teaching aid, enabling students to observe creatures in conditions resembling their natural habitats. The medical profession has likewise realized its benefits. The fish gliding through their silent, predominantly green world in a kind of underwater ballet are the perfect sedative for nervous patients; it is by no means unusual to come across tanks in the waiting-rooms of doctors and dentists, in physiotherapy rooms, hospitals, and indeed in psychiatric clinics. More recently, aquariums have been introduced into prisons.